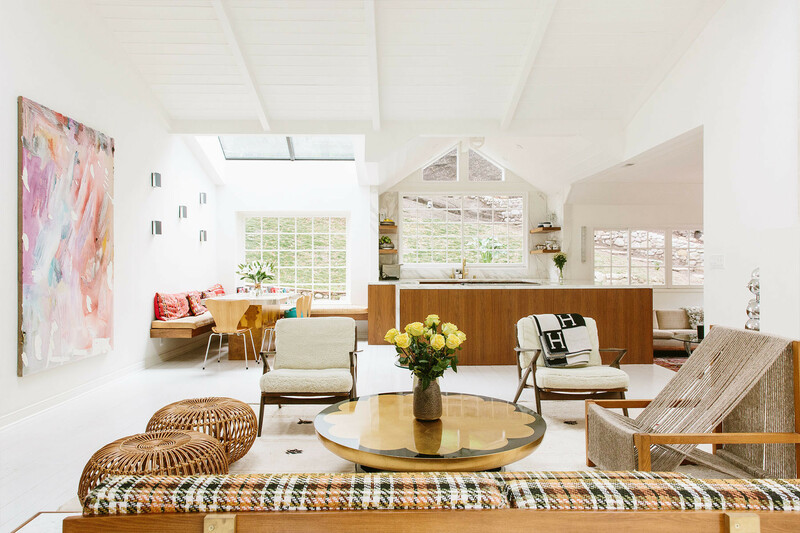 Shelley and Teddy Sanders broke down walls and cut out skylights to give their Beverly Hills home a dreamy sense of flow. Dashiell Manley Art | Vintage Furniture | Couples own Lighting | Lawrence of La Brea Rug. 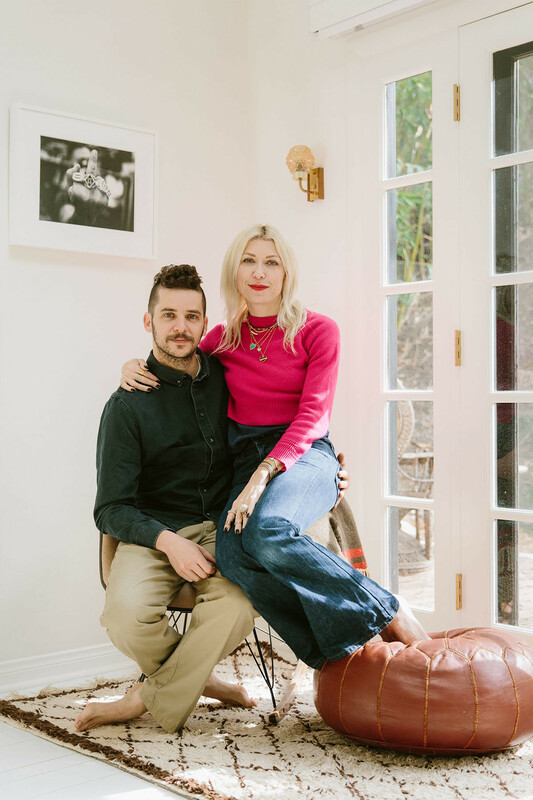 "Go with the flow" is a mantra that perfectly sums up The Last Line founders, Shelley and Teddy Sanders — and their eclectic Beverly Hills home. The designers — who might just be the quintessential Cali-cool couple — launched their joint jewelry venture back in June of 2017. Glitzy ear cuffs, tennis bracelets set with rainbow stones and safety pins à la Sid Vicious, are given a chic, high-fashion edit. The direct-to-consumer brand, best known for its tongue in cheek creations, has become the fine jewelry brand to covet, cutting out the middle man and making it more affordable than ever to procure your own pieces. It goes without saying then, that when asked to close our eyes and picture what Shelley and Teddy Sanders might call home sweet home, expectations were high. After falling fast for the exterior of their leafy Beverly Hills residence the passionate designer admits that loving what was on the inside required a little more work. The Last Line founders share a passion for one-of-a-kind vintage furniture. "It was more like an arranged marriage," Shelley laughs. "Our house was a labor of love. It was a dark hole and the interior had no style. We literally bought it based on what was outside. But now it’s ours and we've grown to love it." light-filled retreat it now is. On arrival, you're greeted by towering oak trees, sprawling plants and fruit trees, ripe for the picking. Behind the home, Teddy designed the landscaping that decorates the expansive backyard, even planting a handful himself. The lush, wide-open space backs directly on to a mountain ridge, providing the young family ample room to explore. Inside, white-washed wooden floors and spectacular skylights, carved out by the couple, ensure the communal spaces are flooded with natural light. Blanketed in California flora, this family home is the kind of house you want to hang out in. Sanders admits she's "living her own Snow White life" — albeit her version is a lot cooler —complete with the occasional visit from the resident "deer family." "There are a ton of birds, too — my kids are obsessed. Teddy planted flowers behind Goldie's bedroom when I was pregnant with her, so that she could stare out her window and always have something pretty to view," says Sanders, when describing her favorite space in the garden. "It’s the only space that’s in bloom year round — no matter what. There's something about a father planting flowers for his baby girl that makes me so happy — I smile just thinking about it." Inside, the good vibes continue. The couple worked tirelessly to create a seamless sense of flow. "Teddy and I went to great lengths and spent over a year-and-a-half removing most non-load bearing walls, and cutting skylights and windows to help achieve this feeling," she says. "Originally, our home had terrible flow. But we fell in love with the outside. When the flow of the home is complimented, we're relieved, because we worked very hard to create it." Eclectic vintage furniture is given a whole new lease of life inside the Sanders' Beverly Hills home. Lawrence of La Brea Rug | Vintage Italian 1970s' Robot Lamps, Set of Two | 1stdibs Sconce Lights | Chairs, Coffee Table, couple's own design | Vintage Sofa, Ottomans, Vase. A modern, open-plan kitchen anchors the living areas, while a mid-century island rendered in marble and oak set in front of a floor-to-ceiling colonial grid window steals the show. 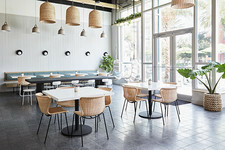 The bay seating around the family table offers a practical solution to a casual dining area that runs off the primary living spaces. This once-dark little space-turned-sanctuary, now encapsulates the couple's shared aesthetic, while serving as a shrine for pre-loved finds. Sanders admits she's "in love" with all things vintage, from the floor-spanning Moroccan rugs that occupy her living room, to the sconces on the walls and all that Chanel hanging in her closet — each piece boasts its own little back-story. 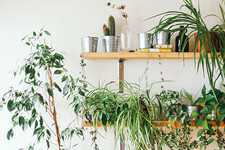 It's a love affair she's nurtured for decades — a collection that certainly wasn't cultivated overnight. "I love things that are soulful," Sanders says. "I love a colorful palette mixed with neutrals and whites. I care about quality and the materials used, which is similar to how I create my pieces. I’m picky about good lines." 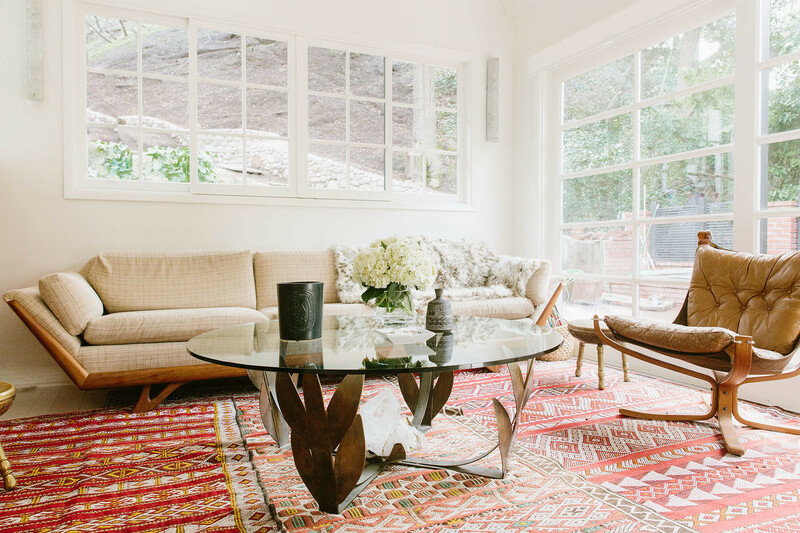 "Good rugs really tie a room together," says Sanders, of her expansive collection of Moroccan rugs, many of which sourced via a traveling friend. 1stdibs Vintage Furniture | Diptyque Candle. 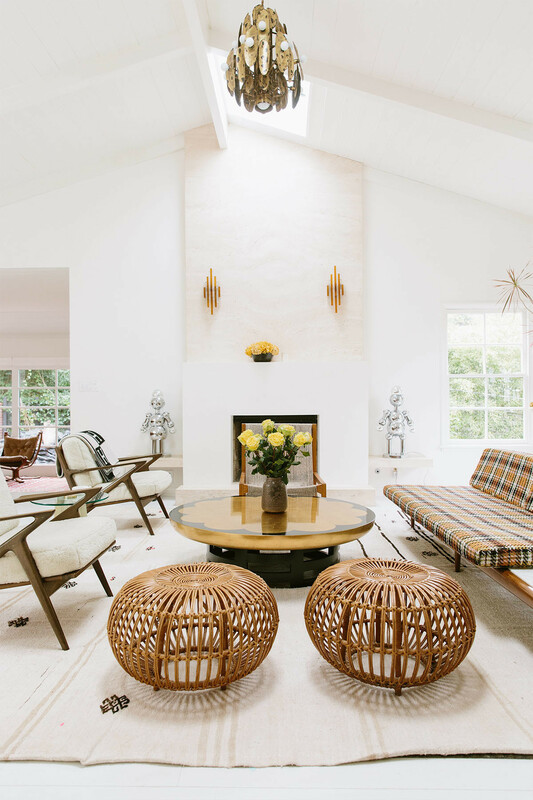 Sanders' treasure trove of vintage (we've come to expect nothing less from an "original eBayer"), includes artful light fixtures (sourced via 1stdibs and eBay) and sleek mid-century furniture, dressed their best in yellow plaid and leather. A pair of vintage Italian robot lamps, originally from the 1970s, guard the fireplace. Pieces take on different forms and function, while the couple's bedroom and ensuite evokes a low-maintenance vibe. Whatever the duo haven't repurposed or rehoused, it's quite likely they've made it themselves. Low-key dining and living spaces encapsulate the couple's off-duty lifestyle. Dashiell Manley Art | Chemex Repurposed Vase | Couple's Own Lighting, Dining Table | Vintage Chairs. Standing out among all those unique pieces, it's hard not to be struck by the painterly presence of the large-scale artwork by Dashiell Manley, a close friend of the pair, hanging gallantly in the entry way. Abstract brush strokes of pale pink and purple give the gallery walls new life, offsetting the fancy floors. Sanders admits she's a firm believer in investing when it comes to procuring the perfect rug, with an impressive vintage collection testament to this — "they really do tie a room together," she says. "Teddy was a photographer before we started The Last Line, so a ton of pieces are actually by him," adds Sanders, when explaining the different works on show throughout the home. "(My son) Howl Sanders created the rainbow art in our master bedroom, and Arrow Sanders created graffiti work." Their daughter Goldie's bedroom, a delightful space with fresh white walls and a window looking out to the garden, is home to brightly colored toys of all shapes and sizes, earthy sculptures, dreamy cotton clouds and her name in lights, literally. An Hermés blanket drapes casually over her crib, because you know, fashion. The duo stuck to a yellow and gold color scheme when designing the ideal space for their daughter, Goldie. Oeuf Crib | Light Installation, Dream Catcher, couples' own design | Vintage Toys, Pouf. "I wanted to create a room that was feminine but not traditional," Sanders explains, on creating a space just for Goldie. "I utilized yellow and gold, and wanted her to be able to grow up and make it into her own. I'm inspired by a million places, a room that I want to be in, a room that I’ve been in that I love, an idea of what a space needs — little bits of everything." While the designer admits that motherhood hasn't affected her eye for good design or knack for sourcing one-of-a-kind vintage furniture — "I definitely care less about the spots on my marble!" she laughs.